St. Peter's liturgy is based on the Book of Common Prayer. Sunday is traditionally when Episcopalians gather to worship. In most churches now, the principal worship service is the Holy Eucharist, or as it is also known, “The Lord’s Supper,” “Holy Communion,” or “The Mass.” In most Episcopal churches, worship is accompanied by the singing of hymns, and in some churches, much of the service is also sung. There are many different styles in which Episcopalians worship, from very formal, almost Catholic styles that have lots of singing, music, fancy clothes (called vestments), and incense, to very informal spoken styles that have less music. Yet all worship in the Episcopal Church is based in the Book of Common Prayer, which gives it a familiar feel to Episcopalians, no matter where they go. Given that the congregation was formed in the mid-1980s, we tend to use more contemporary and inclusive language, as exhibited in the liturgies of Rite II. We also have been using the liturgies from Enriching Our Worship, which can be used on a trial basis with permission from the bishop. Our worship centers on Holy Eucharist, as we believe that we need to be fed by Word and Sacrament in order to live in the world as followers of Jesus Christ. Worship in the Episcopal Church is said to be “liturgical,” which means that the congregation follows the same service and prays from texts that don’t change very much from week to week during a season of the year. The sameness from week to week gives the worship a rhythm that becomes comforting and familiar to the worshipers. Liturgy can be confusing, however, or difficult to follow for the first-time visitor. It often involves switching between two or more books or a service pamphlet, and there may be a lot of standing, sitting, kneeling, bowing, and sung or spoken responses. Liturgical worship can be compared with a formal dance: Once you learn its steps and movements, you learn to appreciate its rhythm and it becomes satisfying to dance, again and again, as the music changes. We begin with the praise of God through singing and prayers, and then listen to as many as four readings from the Bible. Usually, they are one from the Old Testament, a psalm, and one from the Epistles, but there is always a reading from one of the Gospels. There is usually then a sermon or meditation on the readings given by the priest. The congregation recites the Nicene Creed, which was written in the Fourth Century and has been the Church’s statement of what we believe ever since. Next, the congregation prays together—for the Church, for the World, and for those in need. We pray for the sick, we thank God for all the good things of our lives, and finally, we pray for the dead. Then usually, the congregation confesses its sin before God and before one another. This is a corporate statement of what we have done and what we have left undone, and the priest “pronounces absolution.” In so doing, the priest assures the congregation that God is always ready to forgive our sins. Next, the priest stands at the table, which has been set with a cup of wine and a plate of bread—or thin, crispy wafers. Then he or she raises his or her hands and greets the congregation again: “The Lord be With You.” Now begins the Eucharistic Prayer, in which the priest tells the story of Christianity, from the beginning of Creation, through the choosing of Israel to be God’s people, through our continual turning away from God and God’s calling us to return. Finally, the priest tells the story of the coming of Jesus Christ, and about the night before his death, on which he instituted the Eucharistic meal (communion) as a continual remembrance of him. The congregation then shares the bread and the wine. Sometimes the people all come forward to receive the bread and wine; sometimes they pass the elements around in other ways. All baptized Christians—no matter what age, and no matter of what denomination—are welcome to “receive communion,” that is, eat the bread and drink the wine with the congregation, regardless of which Church they were baptized in. This invitation to other Christians who are not Episcopalians is in sharp contrast to the position of other Churches, such as the Roman Catholic Church, which allows only Roman Catholics to receive. Episcopalians invite all baptized people to receive, not because we take the Eucharist lightly, but because we take our baptism so seriously. While the Episcopal Church's teaches that one must be baptized to receive the Sacrament of bread and wine, we at St. Peter's have stretched our welcome to include a wider range of worshipers. 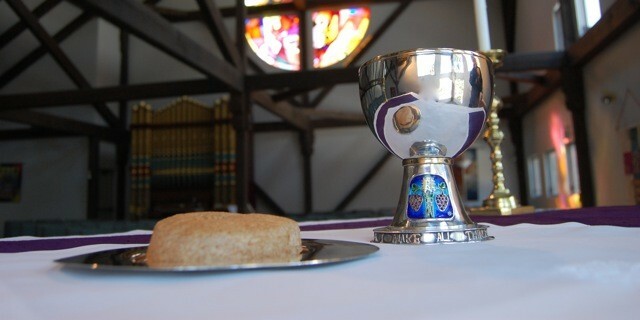 As stated in our Sunday bulletins, 'All who yearn to be transformed and fed by God are welcome to receive the Sacrament of the Body and Blood of Christ at the Lord's Table.' During communion the congregation gathers around the altar in a big circle, and receives the Sacrament together. Those who do not wish to receive communion but would like a blessing may indicate so by crossing their arms over their chest.